Comfort for up to 8. Adventure for All. The all-new Odyssey was created to offer something special to everyone. The interior of the Odyssey has never been more impressive, with exclusive new available features that give everyone more control, more connectivity and more fun. Honda CabinWatch and CabinTalk make it easier than ever to see and communicate with passengers in the rear seats. Honda CabinControl gives everyone the opportunity to control the rear temperature, add music to a playlist and send an address to the navigation. 8-Inch Display Audio Touch-Screen puts everything at your fingertips. Innovative Magic Slide 2nd-Row seats for easier access to the 3rd row and a host of other rear passenger perks make every trip in the 2018 Odyssey a joy ride. Magic Slide 2nd-Row seats standard on EX, EX-L, Touring and Elite. Advanced Rear Entertainment System standard on EX-L w/Navigation and Rear Entertainment System, Touring and Elite. Hands-Free Access Power Tailgate standard on Touring and Elite. This intelligent suite of safety and driver-assistive technologies is designed to alert you to things you might miss while driving. 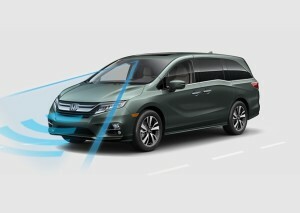 Honda Sensing™ standard on EX, EX-L, Touring and Elite.